What do Norway and Canada have in common? Cold winters, oil and a housing bubble. 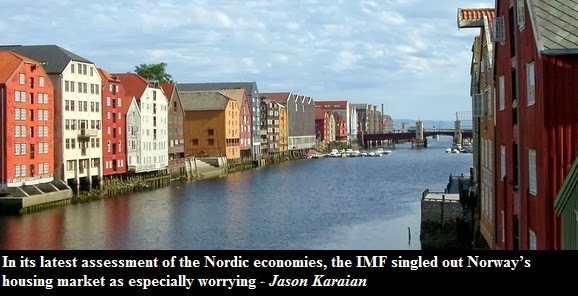 According to the latest report by the IMF, real estate in Norway is overvalued by 40%. 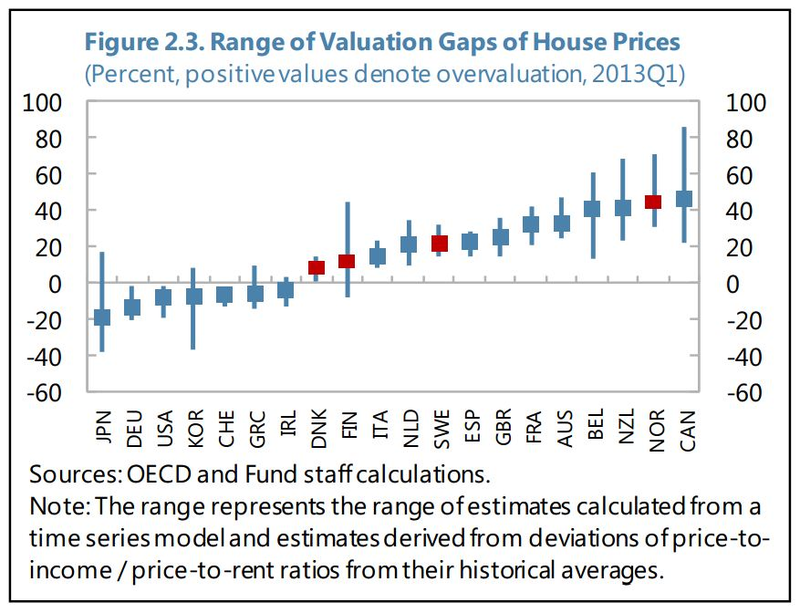 But guess what - according to the IMF's data the only country where real estate is even more overvalued is Canada. Sometimes a picture is worth a thousand words. The below diagram is a perfect example of this. 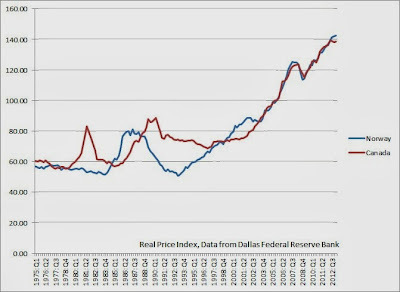 As you can see below, both Danish and American home prices fell by over 20% since 2007 while prices in Norway kept rising. If Norway is not a housing bubble, than what is? 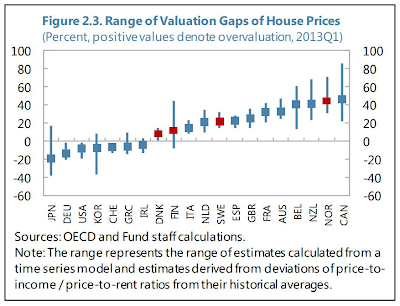 The following chart produced by IMF shows how overvalued or undervalued real estate is in various countries. According to the IMF, calculations are based on comparing time-series data of price-to-rent ratio, price-to-income ratio, credit growth, income growth, constructions costs, short-term and long-term interest rates, and the proportion of working age population. All countries which are undervalued had a housing bubble burst with the exception of Germany which never had a housing bubble. Property values have been falling in Japan since the early nineties. Korea had a major housing bubble in the late '80s. Switzerland had a bubble in the '70s from which it never really recovered. Finally, US, Ireland, and Greece just experienced a property bust a few years ago. Denmark, Netherlands and Spain have yet to reach the housing bottom as prices keep on falling in those countries. Finally, all other countries on the graph are currently experiencing bubble talk. Here's the graph (adjusted for inflation) of property prices in Norway and Canada. 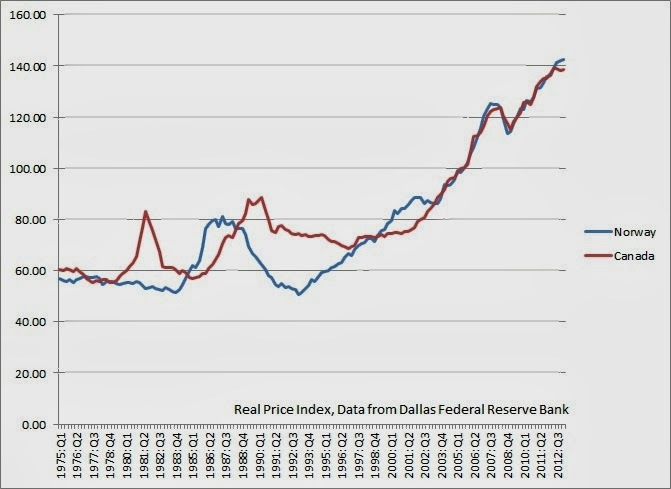 Since 2003, the prices have been rising pretty much at the same pace in both countries. - Real disposable income in Norway grew by 73% between 1993 and 2010. In Canada, real after tax income grew by 21% between 1993 and 2010. - Canadian public debt currently stands at over $685 billion while Norway's public debt stands at roughly $150 billion. The caveat is that Norway has a petroleum funded wealth fund which amounts to over $750 billion. You can read more on Norway's housing bubble in my Ultimate Guide to Housing Bubbles around the World.